Raaga.com: Amitabh Bachchan and Nawazuddin Siddiqui’s film a reality! 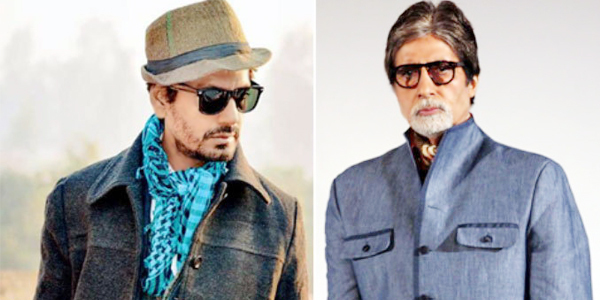 Amitabh Bachchan and Nawazuddin Siddiqui’s film a reality! Ever since Amitabh Bachchan saw Nawazuddin Siddiqui’s BADLAPUR he has been obsessed by the intensity of the brilliant actor. Reports have it that Amitabh Bachchan, who recently experimented with his image in PIKU and worked with sensitive actor Irrfan Khan has been toying to share space with another spirited actor Nawazuddin Siddiqui and has asked his favorite writer Sujoy Ghosh to write a script keeping them in mind. “However I am excited as the workshop will give me to understand Amitji better and we both can give our best,” he quipped.